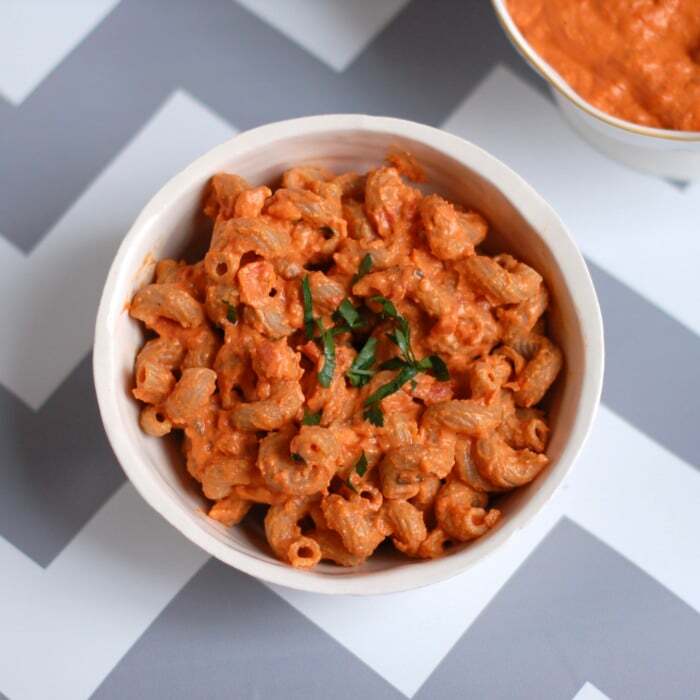 Get a nutrient-rich, flavor-packed dinner on the table in less than an hour with this Creamy Roasted Red Pepper Tomato Pasta. Your family will thank you (and ask for more)! One of my goals with my weekly menu plans is to inspire people to make home cooked meals on a regular basis, give them ideas of what to make, and empower them to actually do it by showing them it’s not so difficult. It always helps when the meals I can put on the menus are quick (take less than an hour, preferably 30-45 minutes), easy (don’t require advanced knife skills and techniques), and don’t contain a laundry list of ingredients (ideal are recipes with 10 ingredients or less). I don’t always succeed at this task, but I make a valiant effort every week – I mean it’s not like I want to spend hours in the kitchen during the week any more than you do! When I saw the theme for The Recipe ReDux this month, I was super excited because it was the perfect way for me to commit to making the type of recipe I want to include on the weekly menu plans, plus I would now have all of my fellow ReDux member recipes to include in future menu plans! You see, the theme this month is 7-Ingredient (Or Less) Recipes – it doesn’t get better than that! It’s Income Tax Season, so our brains could use some easy arithmetic; as in seven-ingredient-or-less recipes. Show us the healthy, no-brainer dish you fix for breakfast, lunch or dinner. 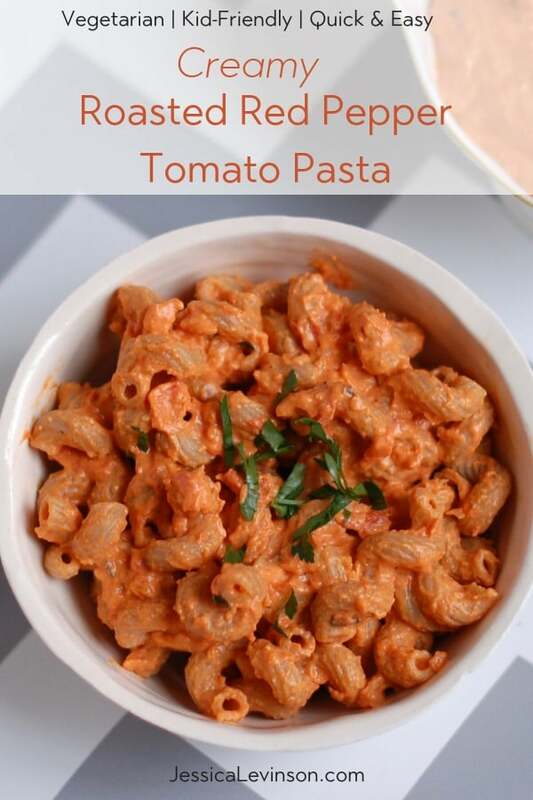 This Quick and Easy Creamy Roasted Red Pepper Tomato Pasta is a recipe I have been making since 2011 with some modifications along the way. I actually shared a version of this recipe on the blog back when I first made it (and took some not so great food pics!). As I mentioned in that old post, the recipe was inspired and adapted from one of (fellow dietitian) Ellie Krieger’s recipes that I found in her first cookbook, The Food You Crave. Over the years the recipe has evolved to what it is today – a combination of roasted red peppers and sun-dried tomatoes, ricotta cheese in place of feta, and the addition of chickpeas for an added protein and fiber boost. To make the sauce, I sauté onions, garlic, sun-dried tomatoes, jarred roasted peppers, and freshly chopped rosemary. I then add the sautéed mixture to a food processor or blender along with chickpeas and part-skim ricotta cheese. Since I use sun-dried tomatoes packed in oil, I don’t need to add any oil to the pan when cooking the veggies. However, if you use dried tomatoes not in oil, you will want to heat oil in the pan and then sauté the onions and garlic before adding the sun-dried tomatoes and peppers. A few other notes about this recipe to make your life easier. If you want to save even more time, skip the onions and garlic (or use garlic paste) and go straight to the blender with the sun-dried tomatoes, roasted peppers, rosemary, chickpeas, and ricotta. Personally, I love the flavor boost from sautéing the veggies, but if you are really pressed for time, it will still come out delicious. Plus you’ll have one less pan to wash! If you are on a gluten-free diet, sub chickpea pasta or any other gluten-free pasta of your choice for the whole wheat pasta. I love how this comes out when I have used Banza chickpea pasta in the past. Forgot to pick up ricotta at the store, but have cottage cheese on hand? You have the perfect substitute – pureed cottage cheese has the same consistency as ricotta. No one will know the difference. Last but not least, if you want to add some spice, I recommend adding some red pepper chili flakes to the sauce. Or if you’re serving to kids and adults, sprinkle some of the spice on the adult portions only. 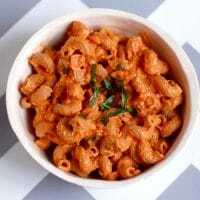 I have a feeling you’ll like roasted red pepper tomato pasta and so will everyone and anyone you serve it to, including your kids if you have any. How do I know? Well, for one thing my kids, husband, and I devoured it. Luckily there were some leftovers because the next morning at breakfast one of my daughter’s asked if there was any left for lunch! 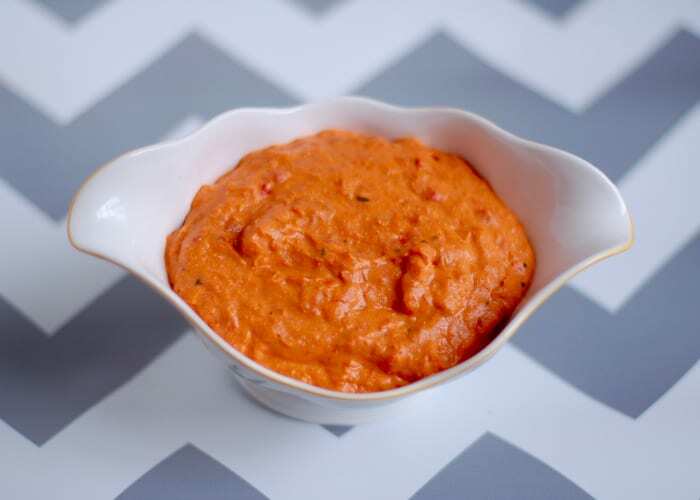 If you love vodka sauce, this is also going to be a winner – my hubby can attest to that. And score for it being so much better for you! As a disclaimer, the recipe technically has more than 7 ingredients; however, I took the liberty of deciding that olive oil, salt, pepper, and optional herbs don’t count toward the number of ingredients. After all, these are staple pantry items everyone should have on hand! With that said, let’s get to the recipe! Sweet roasted red peppers and savory sun-dried tomatoes are the base of this creamy sauce that perfectly coats your favorite pasta. Ricotta cheese and chickpeas add a boost of calcium, protein, and fiber, making this a satiating meal that's quick and easy for those busy weeknights. Cook pasta according to package directions until al dente. Drain pasta, reserving about 1/2 cup of pasta water. While pasta is cooking, heat a small skillet over medium-high heat. Add sun-dried tomatoes with their oil to the pan and stir for about 2 minutes. Add the onions and sauté 2 to 3 minutes until translucent. Add garlic and stir 30 seconds until fragrant. Add roasted peppers and stir together for 2 minutes more. Add chopped rosemary (if using) and stir another 30 seconds. Remove from heat. Drizzle a bit of olive oil in bottom of pasta pot and return drained pasta to pot over a low flame; toss to coat with oil. Toss pasta with sauce, adding reserved pasta water if necessary to thin out the sauce. Serve hot. Do you have a favorite quick and easy weeknight dinner recipe? Does it have seven ingredients or less? Disclosure: This page contains an Amazon Affiliate link. If you purchase a product through this link, your cost will be the same but I will receive a small commission to help offset the costs of running my blog. Thanks for your support! oh YUM – I’m definitely making this one! I always have a jar of Trader Joe’s roasted peppers in my pantry – pinnnig. So do I! Hope you enjoy it – I am sure Mia will! This looks great and so creative. I will definitely be trying this one! Thanks so much Ann! Hope you and the kids love the recipe – my girls sure did! YUM! I love everything about this meal. Sun-dried tomatoes are one of my favorite flavors on earth. Thanks for the recipe Jessica! Thanks so much Kim! Hope you enjoy it – let me know if you make it! This looks perfect to me! I am the only one in my family that likes bell peppers, BUT, I bet this sauce that has them pureed with other yummy ingredients will be a winner with my family too 🙂 Can’t wait to try this! Thanks EA! I can’t imagine the whole family not liking this even if they don’t like bell peppers, but you will definitely have to keep me posted and let me know how it goes! Thank you! Can’t wait to hear how you like it Liz! I saw this on Instagram and immediately wanted a bowl. It looks so creamy and delicious, I can’t wait to try this! Thanks! Thanks so much Lauren! Can’t wait to hear how you like it! I’ve been WAITING for this recipe since you teased me last week, so thanks for posting it!! I like the theory behind your staple ingredients, I feel that way with spices and hot sauce :)! I love this recipe, it looks so rich and creamy too, like I want to lick the spoon! Nice work girl! Haha…I’m such a tease 😉 Oh, sriracha is definitely a staple ingredient in our house – my husband is OBSESSED! This is definitely a lick-the-spoon type of sauce, lol! Enjoy! Looks so good, Jessica! Love how you add protein and fiber with the chickpeas. I’ve pinned it to try soon! Thanks so much Marisa! Can’t wait to hear how you like it. Thanks for Pinning! Thank you! I love making comfort food better for you! This looks so so good – and the sauce would be jam packed with flavour! Thanks Kristy, it definitely is packed with flavor! Shh, don’t tell — I did eat some straight from the spoon 🙂 Haha..yes, you have to be in NYC apartments! LOVE the idea of using chickpeas in your sauce – brilliant! Thanks so much Anne! I love how it adds a creaminess and a protein and fiber boost! If I make a big batch of the sauce, how long do you think it will keep for in the refrigerator? Hmmm…i’m not 100% sure since we mixed all the sauce with the pasta and ate it all within a couple of days, but I would think maybe 3-4 days? If you want to keep it longer than that I would suggest freezing it. While I haven’t tried that either, I see no reason why it wouldn’t freeze well. Looks so, so good! I’m all about quick pasta sauces, YUM. Can’t wait to try this! Thanks so much Alex! Hope you enjoy it! So healthy and hearty. I can’t wait to try this! Thanks Liz – can’t wait to hear what you think! Love that you included gluten free and time saving options in here as well! Looks easy to throw together (great for us moms out there) and delicious! So glad that info was helpful Kristina! This is definitely a dish moms will be happy to make – easy and the kids love it! Hope you enjoy it if you give it a try! Looks so good! I love the addition of chickpeas and I have an almost whole container of vegan ricotta to use up! I just don’t have the sun-dried tomatoes or this would make a quick dinner tonight. Added to the list for when I get candied ginger (yes still need to get it, things have been crazy and my husband couldn’t find it when I sent him with the list along with 3 other things I needed). Can’t wait for you to try it Sarah! Hope things calm down soon so you can enjoy some quiet with your family for the holidays. I love that you add the flavor of sun-dried tomatoes. And chickpeas – now that was a surprise! Thanks Alisa! Love adding the chickpeas for creaminess without cream and of course the added nutrition! Such a roasted red pepper fan! This looks so good! Can’t wait for you to try this then! Wow! This looks amazing…I am drooling! I cannot wait to make this for my family over the holidays! Thanks Whitney! Hope you and your family enjoy it. Let me know! You can never go wrong with a good pasta dish! This looks and sounds so good! I cannot wait to try it! Thanks Kristina. Hope you enjoy it. I am sure your little guy will! How perfect! And roasted tofu sounds like a delicious accompaniment and protein boost! This sauce is so rich and creamy — and healthy! I’d highly recommend taking the extra few minutes to sauté the garlic/onion/veggies per the instructions because the flavors are incredible. I might experiment with adding some Greek yogurt in place of the ricotta next time for a tangy flavor and lots of protein. I’m so glad you enjoyed this recipe Dana! Thank you for the awesome review. Would love to hear how you like Greek yogurt in it next time if you give it a try!